Last week, Lars Larson challenged us to integrate interleaving into our courses, basing his proposal on principles found in Brown, Roediger, and McDaniel’s Make it Stick (2014). One simple approach to interleaving is to bridge the introduction of material over two classes while also working on a different topic or concept. Although I know to do this, I sometimes fall for trying to package an important concept into one class session. This occurred last week in my Maximizing Study Abroad course. I had planned to have students explain and apply material from a book chapter on Milton Bennett’s Developmental Model of Intercultural Sensitivity (DMIS) through discussion and in-class group work. Since we had just returned from spring break, I also used the beginning of the hour for students to recall what they had been learning prior to the break. This took a bit longer than I expected, as did our group work, and by the end of the hour, we were not done with my lesson plan. As I gathered my things at the end of class, I realized how happy I was not to have finished my intended plan. I could now interleave the material by having students read over the week for the next topic on making cultural inferences and then guiding students the next week to recall Bennett’s DMIS and continue committing it more deeply to memory through elaboration and application. Lang notes that students may perceive interleaved learning as moving more slowly, but he cites both laboratory and classroom research that indicates better retention and recall among learners who practice interleaving. Applying interleaving also promotes relating concepts to each other in the classroom and through assessments. Eliciting responses that connect the new topic to some other aspect of the course material. By engaging students in retrieval practice within an interleaved classroom, we will increase the likelihood of their ability to recall and discriminate concepts, connections, and applications of the material we teach into the future. As we embrace Lars’ challenge from last week, we can use some of the above approaches to integrate interleaving into your course and lesson plans. For example, when I meet with my Maximizing Study Abroad class next, we will (1) finish some work on Bennett’s intercultural sensitivity scale, (2) interleave it with questioning how it might connect to stages of cultural adjustment, and then (3) move on to the first stage of learning about making cultural inferences. If you would like to discuss interleaving teaching and learning, please feel free to contact me at white@up.edu. Jeffrey White is an instructor of German and the Learning Commons administrator in Buckley Center 163. To discuss with Jeffrey how your students can practice and enhance their learning the Learning Commons, contact him at x7141. When we on the academic side of the University have concerns about the mental health of our students, one of our obvious resources is the staff of the UP Health and Counseling Center. Whether we get there via Early Alert or through a direct contact, it can be helpful for faculty and academic staff to know who might help us figure out how to help our students – and who is talking to the students who avail themselves of UP services. For this 2017-2018 academic year there are two new psychologists on staff, along with several returning psychologists providing counseling services (and each year there are also graduate practicum counselors in training). The new psychologists this year are both somewhat on the administrative side of things, though with extensive backgrounds providing counseling services. Carol Dell-Oliver, Ph.D. is the new Director of the Health and Counseling Center. She has been a licensed clinical psychologist for 24 years, with extensive experience in university settings and private practice. Her areas of specialization include anxiety, depression, disaster recovery, and the assessment and treatment of trauma-related disorders. Her goals for the Health and Counseling Center are to assess UP’s current mental health, substance abuse and suicide efforts and to create a strategic plan to implement improvements. Other goals include expanding services and outreach efforts in health and wellness promotion, and improving students’ access to services to reach diverse and/or underserved populations. I obtained my Ph.D. in Clinical Psychology from the California School of Professional Psychology in Berkeley/SF Bay Area. I trained in the Counseling Centers at Stanford and Boston Universities. Since my training I have held positions at Emory University as the Group Coordinator, George Washington University as a Staff Psychologist and Supervisor, Humboldt State University as their Director of Training, and at Clark College as the Director. I also have extensive experience in other levels of care including inpatient, residential, day treatment and private practice. I utilize an integrated approach to my therapeutic work with students including practical and solution-oriented, as well as brief psychodynamic and object relations modalities. I help student/clients understand, experience and manage their own emotional states. I often approach this from a lens of mindfulness, in terms of self-observation without judgment, and self-compassion. Some of my areas of interest and expertise include identity development, sexuality and spirituality. 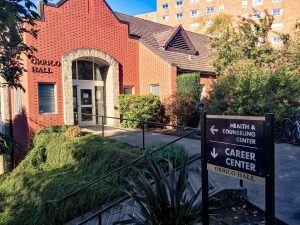 University of Portland Health and Counseling Center is staffed by four full-time licensed psychologists and two pre-doctoral trainees who hold master’s degrees in psychology. The Counseling Center staff are committed to providing an emotionally safe, accessible, and compassionate space for all University of Portland students. We strive to integrate multicultural humility and competence into our everyday functioning, firmly planted in the belief that all people have dignity and are deserving of respect. Clinicians utilize empathy, open-mindedness, and the therapeutic relationship to increase insight and decrease emotional distress. All consultation and therapy meetings are confidential and student health information cannot be shared without written permission. Mental health counseling is available at no cost to all students enrolled full time at the University of Portland. We provide short-term counseling services for students experiencing a range of concerns. First visits are considered a consultation. These appointments last about 20 minutes and are focused on immediate student concerns and to develop a plan. Due to our model, it is possible that an off-campus referral for services will be made. Mark Meckler, Associate Professor of Strategy and Leadership in the Pamplin School of Business, created a 3-minute slide show that provides an overview of the structure and possibilities of faculty-created Teaching Circles. There is no single method for doing Teaching Circles “correctly,” but this slideshow gives you insights into the qualities of effective Teaching Circles. Clicking on this link will take you to a Powerpoint file that you can watch by clicking on the Slideshow view Teaching Circles ppt. Alternatively, clicking on this link will take you to a movie file that has the same slides Teaching Circles movie.